Given by Alexander III Emperor and Autocrat of all the Russias to Empress Marie Feodorovna for Easter 1887. 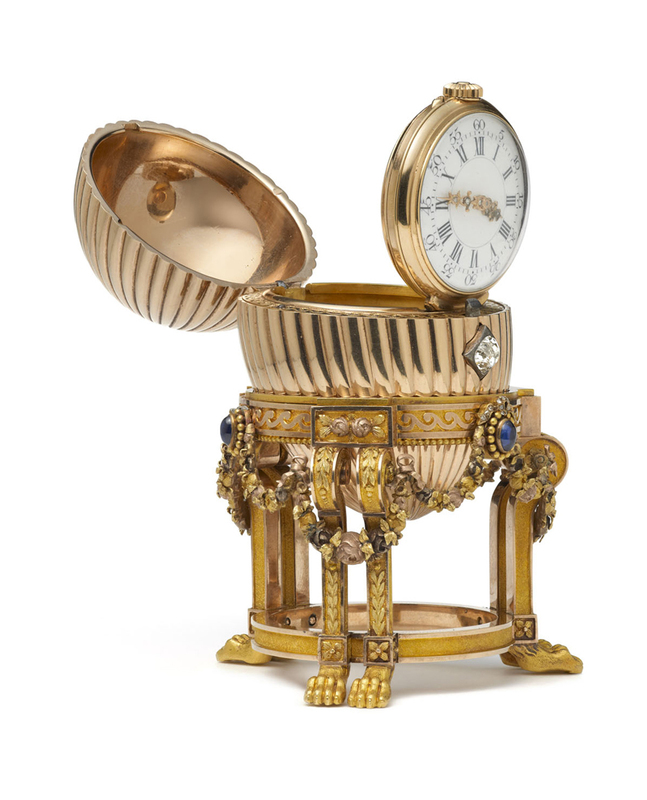 The jewelled and ridged yellow gold Egg stands on its original tripod pedestal, which has chased lion paw feet and is encircled by coloured gold garlands suspended from cabochon blue sapphires topped with rose diamond set bows. It contains a surprise of a lady’s watch by Vacheron Constantin, with a white enamel dial and openwork diamond set gold hands. The watch has been taken from its case to be mounted in the Egg and is hinged, allowing it to stand upright. August Holmström, St. Petersburg, 1886-1887. Fifty Imperial Easter Eggs were delivered by Carl Fabergé to Emperors Alexander III and Nicholas II from 1885 to 1916. The Third Imperial Easter Egg was until its recent rediscovery among the eight lost Imperial Fabergé Eggs. The Egg was exhibited at Wartski in April 2014. It was last shown over 112 years earlier. Henry Bainbridge; Carl Fabergé’s London agent. The Cabinet’s account books contain an earlier note made on the 18th May 1887 of a payment of 2160 roubles to Fabergé for the same ‘egg with clock’. 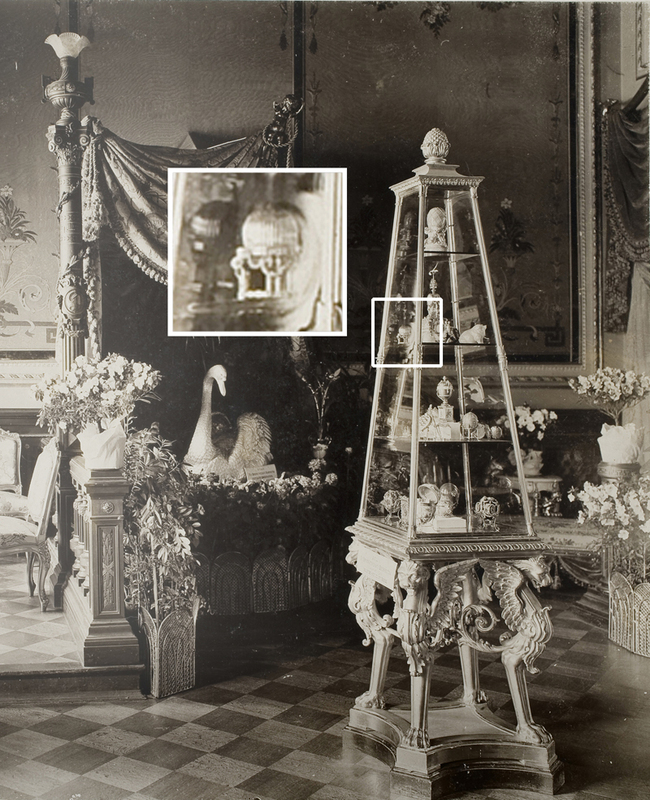 The Third Imperial Fabergé Easter Egg displayed among Marie Feodorovna’s Fabergé treasures in the Von Dervis Mansion Exhibition, St. Petersburg, March 1902. 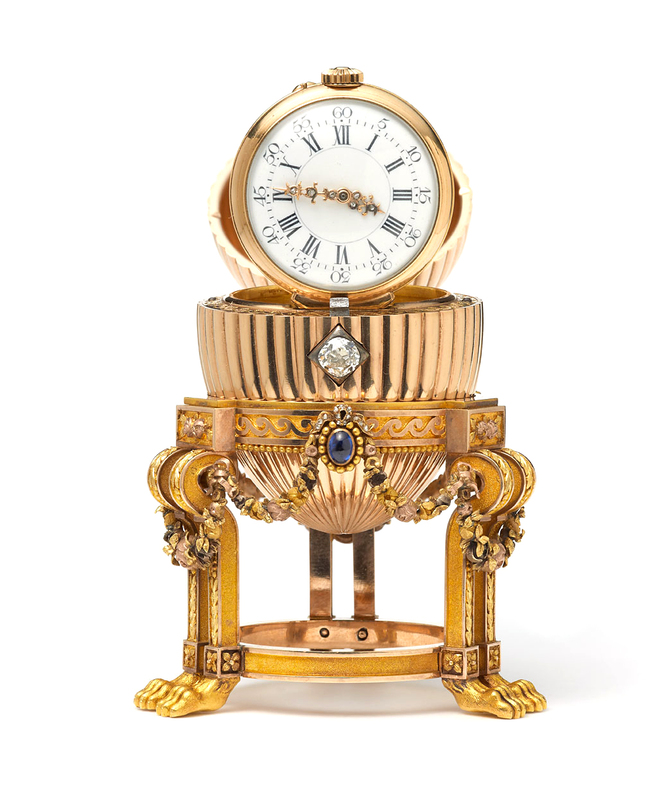 Gold Watch in egg- form case on wrought three- tone gold stand set with jewels, fourteen Karat gold watch in reeded egg shaped case with seventy-five point old mine clasp by Vacheron Constantin; on eighteen karat three-tone gold stand exquisitely wrought with an annulus, bordered with wave scrollings and pairs of corbel like legs cisele with a capping of roses, pendants of tint leaves depending to animalistic feet with ring stretcher: the annulus bears three medallions of cabochon sapphires surmounted by tiny bowknotted ribbons set with minute diamonds, which support very finely cisele three-tone gold swags of roses and leaves which continue downward and over the pairs of legs. Height 31/4 inches. The Egg remained in the USA and was recently bought for $14,000. The purchasers were unaware of its provenance and the price paid was calculated only on its intrinsic value. Kieran McCarthy quoted by Reuters.